With great respect and a slight feel for the excruciating agony that those who served in a thankless war in the Republic of Vietnam experienced, the following is an attempt to provide a snapshot of history as lived by those boys we grew up with in Sheffield. They were our sons, our husbands, our brothers, our schoolmates, and our friends. There are many who served from the area, but few could match the nightmares experienced by the two subjects of this story: William “Bill” Presley and Harold Lee Hovater. Sheffield may never be more proud of its boys, turned men by war. Sheffield, in Colbert County, Alabama has a long history of volunteers in each and every war since our Independence. I am so proud of my little hometown of Sheffield. If only, it could return to the thriving little city it was once. Look closely. Come closer. Closer. You can clearly see that the war lives in the mind of this hero. It plays, like a 3-D video with maximum volume surround sound, in his mind and it shows in his eyes. It plays pretty much nightly. Harold Lee Hovater is just a hometown boy. If you see him today he seems so like your brother, your cousin, your neighbor, or your husband. And he is, but more importantly he is the stuff that heroes are made of, In fact he IS a hero. A real life, living and breathing hero. But if you could see what he sees, especially when he tries to sleep, without a doubt, you would shudder with all that he has gone through for you, for me, for our children , and for our children’s children. Harold Hovater is proud of his family. He and his wife, Vicky Laster Hovater live in a nice apartment in Tuscumbia, Alabama. Vicky tells of her love story with Harold. In the their youth Harold and Vicky had dated. She was three days away from marrying someone else when Harold stated he needed to talk to her before she married. She never had that talk with Harold. The day after the wedding Harold joined the Army. Each married and went about having children and a family of their own. Two years ago, she contacted Harold and told him that she had loved him all her life. That was it for both. They left everything behind them and became a couple after all those decades. They truly seem to be happy. Vicky would grab Harold’s hand and squeeze it tight when it was obvious that he was having a hard time relaying his memories of the war. For Harold Hovater the adage that war is hell is as true today as it was in the 1960s when the war was raging. Vicky has one son Jon-Thomas Willet and Harold has five children all from previous marriages. When asked if I knew Lee Hovater, the name seemed familiar. He grabbed a photo of his son Lee Hovater and pounded at his chest saying “…he is my heart.” Those at Leighton Elementary will remember Lee Hovater as a student in Vicki Turberville’s class. Lee Hovater was a special needs student, he is now 34 years old. Harold’s children are Tammy Hovater, Lee Hovater, Roger Hovater, Casey Hovater, and Jennifer Hovater Collett. Harold’s five children and Vicky’s one child are now Harold and Vicky Hovater’s six children. Harold joined the Army and enlisted in Company A, 8th Cavalry Regiment, 1st Battalion of the Light Weapons Infantry of the U. S. Army; and trained. They saw service in the Republic of Vietnam: South Vietnam. Harold and his unit flew into South Vietnam. He said it looked just like they were flying onto Panama City Beach. It seemed picturesque to the soldiers just arriving. They did not stay long on the beach scene, but entered the steaming jungle of Vietnam to get the job done for their America. It was in the jungles of Vietnam that every breath was one more breath toward living to get home to tell the stories of his bravery. Harold Hovater, Leldon Roden, Herschel Kyle, and Steve Kyle all joined the Army together. It was Steve Kyle that Harold would wind up serving with in Vietnam. Harold served in the Spirit of America Platoon. Harold’s best friend was Ray Ashnault. This account of the war in the jungles of Vietnam is dedicated to Raymond John Ashnault at the request of Harold’s family. That seems like such a small way to honor one of our Heroes of the Shoals just a little bit. A little more information about Harold’s best friend follows. Raymond John Ashnault was born 17 April 1948 in Union County, New Jersey and lived in Cranford, Union County, New Jersey when he entered service. He held the rank of United States Army Specialist 4 and served with Company A, First Battalion, Eighth Cavalry, First Cavalry Division. His tour date started 2 Dec 1968. He was of the Catholic faith. He was deployed in defensive position with this Battalion when a friendly tank crew accidentally fired a shell on them that was directed at hostile forces. The prior June he had been injured during an offensive and was awarded a Purple Heart and Bronze Star with a V for Valor. His death came shortly after his discharge from treatment for these injuries. Ray’s casualty status is listed as hostile dead: killed out-right. It is also noted that his death was Not Booby Trap Connected: None Of The Above; Other Weapons (including Cutting Instruments, Piercing Instruments, Blunt Instruments, Etc. Specialist 4th Class Raymond John Ashnault was killed outright in a war that was not declared to be such by our President or our Congress in Binh Long Province of the Republic of Vietnam in South Vietnam. Harold grieves for the loss of his very best friend of all in that lonely foreign place. His burial site is located at Saint Gertrude’s Roman Catholic Cemetery. The cemetery is located in Colonia, Middlesex County, New Jersey, USA. He is listed on The Wall of Vietnam soldiers killed in action. His name is located at: Wall Number: P-19W / L-65. May God bless your soul; and may your spirit of patriotism live on forever, and may your very best friend find peacefulness, Specialist 4th Class Raymond John Ashnault. Another good friend in the same unit and who served with Harold and Ray Ashnault was Sgt. Leonard Bauck. He was killed in action on 2 June 1969. Harold recounts those dates like rote. If we could see in Harold’s mind’s eye, he probably relives their deaths second by agonizing second. The accompanying photos show a proud display of just some of the awards that Harold Lee Hovater earned during his tours in Vietnam. He earned one Purple Heart when a direct hit exploded and ripped his head open. He earned the second one when shrapnel tore into his arms. He has five Bronze Stars. He is most proud of one in particular. The military ceremony included General Westmoreland awarding that Bronze Star in person to one of our Heroes of the Shoals – Harold Lee Hovater. It was Gen. Westmoreland who pinned that Bronze Star on the chest of one who richly deserved the award. Vicky has tastefully mounted Harold’s medals and awards on the wall of the living room in their home. The wall is covered. William “Bill” Presley grew up in our southwest Sheffield neighborhood. He was ‘one of us’. He was special as they all were, and a handsome guy to boot. He survived the war well—but only as well as he wants you to see. He has wounds he walks around with every breathing second of the almost fifty years since his experience in the Vietnam war began. He succeeds in his daily life. But, oh those torturous nights he still experiences. He did not talk much about his service, just about those from our neighborhood who went into combat in the same war. Bill Presley talks in a calming voice about the experience in South Vietnam; the tenor of his voice seems to soothe the listeners as he talks. What seems to bother him most is that five young southwest Sheffield boys served together. But only one returned home. The one who returned home was him. He was the only one alive to come back home. Bill Presley is our quiet hero. He does not complain. He tries to ease the pain for others; maybe that helps him as well. He is also one of our Heroes of the Shoals. He and his wife, Nelda, travel sometimes on their motorcycles. Life seems good for Bill. One of the four southwest Sheffield boys who was killed in action in South Vietnam was David Rolland Jackson. David Jackson was a Warrant Officer and died a victim of a helicopter air crash on land. He was with the Army Reserve which was active in the US Army. He served in Military Region 1— Quang Tin. He was born 23 November 1942 in Sheffield, Alabama and was killed in action at age twenty-six on 25 Sept 1969. He was the commander of the rotary wing aircraft when it was downed in the Province of Quang Tin. David Jackson left a grieving wife and children. He left a widow, Mrs. Mary W. Jackson, a son David R Jackson II, a daughter Jill S. Jackson, his mother Mrs. Lois Jackson and other relatives. He had a funeral with full military honors and was interred at Oakwood Cemetery in Sheffield, Colbert County, Alabama. His number on The Wall is P-17W L-07. Another of the four southwest Sheffield boys who was killed in action in South Vietnam was Dennis Lavern English. Dennis lived in southwest Sheffield, but the family moved to Russellville in Franklin County, therefore, His name does not appear at the Vietnam Veteran’s Memorial near the Standpipe in downtown Sheffield. His name appears on the memorial in Franklin County. Dennis English only served twenty days in Vietnam. His tour of duty began on the second of August; he was killed in action on the twenty-first of the same month 1969. Dennis served as a Private in Company HHC of the 60th Infantry of the 2nd Battalion in the Light Weapons Infantry. Dennis was a ground casualty from a gun shot or small arms fire. His body was recovered from Military Region 3 in Long An. Dennis English’s number on The Wall is P-19W L-85. Dennis was my father’s youngest brother, we lost him to war before I was even born. I have always wondered about him. What he was like, what music he listened to, was there someone he had waiting for him at home? These questions and countless others have been left unanswered. He was so young like so many others that died so far from home. I have posted on other site[s] to see if there were any soldiers who served with him that might have some answers but have not had any luck. My father John was over there at the same time. He has returned home with memories too painful to discuss and those include those about his brother. I have a picture of Dennis, he is about 12 year old in it and all smiles. The few comments that have slipped through from my dad are those of a sweet boy who everyone loved and could have done good in this world. I wish I had more to offer you about him. I look forward to reading the article. Who knows maybe there is something more that the men who served in his unit can tell me. If there is please feel free to give my contact information. I would really love to know more about him. My hopes have always been to find someone who could fill in a few of the blanks, maybe find a few pictures so that I could continue telling my children about a young man who gave all in a country so far from home. His loss and those of the men with him that didn’t make it home and those who did but [were] damaged and scared should not be forgotten. Another of the four southwest Sheffield boys who was killed in action in South Vietnam was Howard Handley. Quiet unassuming young Howard, it is hard to believe he was gone so young. I can visualize him as he looked in the 1950s with his golden tawny brown complexion and his crew cut hair that glistened the lightest blond in the sun. He never got to have a family. He will never know the heartache and joy that comes with having children. But, alas, he will forever be young. His tour of duty included Saigon. He was a Staff Sgt, Specialist 5th Class ,Infantry Operations and Intelligence Specialist in the Military Region 3 – Tay Nnh for the US Army. He was killed as the result of artillery or rocket fire; he was ground dead but his body was recovered. He died of wounds received in action near Saigon; the obituary was published in the Times Daily Newspaper on 21 September 1968. He was killed in action 13 September 1968. He was but nineteen years old. Howard was one of a large family of children born to George Hasten and Flora Belle Handley of Sheffield. His siblings were: James, Donald, Billy, Catherine, Wallace, Margaret, Gary and Kayla. This family lived on the next street from our house in southwest Sheffield on the same side of the street as Jimmy and Earl Johnson. The boys of like ages were all good friends; some still are today. The parents and family of Howard’s would visit The Wall any chance they got. Howard’s Wall Number is P-44W L-498. The last of the four southwest Sheffield boys killed in action in South Vietnam was Robert King. Robert and his family lived behind the Winston Cemetery on Hook Street. Right there is where Sheffield meets Tuscumbia. His sister Joan was in my class at Southwest Elementary. Robert Henry King was born, likely in Winston County, on 12 February 1944 to Mr. and Mrs. Benjamin Harrison King; he was the namesake of his paternal grandfather who was a lifelong resident of Winston County, Alabama. His home city was Tuscumbia in Colbert County, Alabama on the date of his enlistment. His tour start date was 17 November 1967. Robert King served as a First Lieutenant in the 117th Aviation Company, 12th Aviation Group of the 222nd Aviation Battalion in Province 42. Robert was a rotary wing aviator for the Army. The date of his death is 25 January 1968. He died serving his country in the Republic of Vietnam (South Vietnam). He was married at the time of his death. His Wall number is P-44W L-498..
Robert King was one of the handsome hometown boys that graduated from Sheffield High School in the class of 1962. His senior portrait is featured top left of page 21 in the Demitasse 1962. He is listed in the Index as Bob King. There were others from that senior class that would serve their country in that undeclared war in that faraway land of jungles. Hovater and Presley acknowledge they suffer from PTSD. The nightmares these two heroes have are indescribable. Bill says that his wife, Nelda Holloway Presley, knows better than to wake him during one of his nightly movies-in-his-mind. If he does not get awakened, he does not remember the dream, or should I say nightmare. Vicky Laster Hovater, on the other hand says that she does wake her husband up when he has one of his frequent night terrors. The two heroes discussed the disorder and the huge numbers of vets who continue to be plagued with the terrors that anxiety of war has visited upon them. One thing that Bill Presley stated helps him is to go to the gatherings that vets like him have, such as reunions. He says that talking to someone that has been there and had similar experiences during and after the war helps. It seems that vets can talk to vets, while vets find it impossible to talk about their experiences with the rest of us. That is so very understandable and seems to be true of veterans of all wars. Follow your health professional’s instructions. Although it may take a while to feel benefits from therapy or medications, most people do recover. Remind yourself that it takes time. Healing won’t come overnight. Following your treatment plan will help move you forward. Talk to someone. Stay connected with supportive and caring family, friends, faith leaders or others. You don’t have to talk about what happened, if you don’t want to. Just sharing time with loved ones can offer healing and comfort. Consider a support group. Many communities have support groups geared to specific situations. Ask your health care professional for help finding one, look in your local phone book or contact your community’s social services system. And then there is consideration that is needed for those surrounding the veteran with PTSD; this is what may be overlooked especially by those who surround the veteran. The Mayo Clinic provides us with the understanding that Post-traumatic stress disorder can significantly strain the emotional and mental health of the affected person’s caregivers and loved ones. In fact, the term “compassion fatigue” was coined to describe the feelings, such as depression and helplessness, that commonly develop in those close to a person with PTSD. So, even the ones who never left home can suffer dramatically along with the heroes that returned. The next logical topic brings our narrative to how the government handles the needs of those who have returned from service and their families. Mighty poorly is what I have noticed from those that I have known over the years who have tried to obtain services. If benefits are provided at all, the time span (especially for the War Between the States) was to begin the benefits after most all of the intended recipients are dead. There are the VA hospitals, but the service and the quality of the service is just not there; not even after all these one hundred and fifty years or more of existence. Sometimes the veterans can not communicate with the doctors and other personnel because of a language barrier; and the turn-over rate at these facilities is astounding. Bill and Harold agree that veterans who have medical needs or who suffer from PTSD are in a pickle. Veterans have a hard time getting disability benefits. At first the government would not acknowledge the disorder, the government dithered with beginning treatment, and now for the last forty-six years or so the disability benefits for the veterans is a hard fought for battle. It seems that a veteran who gets his head blown open is only eligible to a thirty percent disability. And a veteran who has both arms ripped by shrapnel is only eligible to a twenty percent disability, iirc. There was no mention of what the loved ones might suffer on the government’s part. But to be fair, a vet can get a Purple Heart for having his head exploded open, and for damage to both arms in an attack by the enemy of war can earn him another Purple Heart, but try to work and make a living to raise a family with all that plus coping with all the complications added on by Post traumatic stress syndrome. The Purple Hearts are more than well deserved, but do our veterans not deserve more for their service to our country? Something tells me that the hospitals, the caregivers, the medicine, the processes would all be improved that are provided by our tax dollars, if the elected and appointed government officials were forced onto a health plan that included using the VA facilities, personnel, and processes. Another similarity that Bill Presley and Harold Hovater noted was veterans seem to have a problem with keeping a stable home life. They both gave some thought to the topic and agreed that many veterans they know of have had multiple marriages. Three seems to be the magic number. Perhaps it has a lot to do with “compassion fatigue” on the part of the spouse, perhaps it is just that the war rages on the mind of those who returned from war. Perhaps, it is just normal behavior reflected by our society of the day. But, it seemed to bother both heroes. The question in my mind is this: What do the young boys who went to Canada, shot off a toe, enrolled in college, or got married just to avoid the Vietnam War wonder and worry about today? Are the heroes or zeroes in their own mind? Even if one did not love the war; every American must love the soldiers, sailors, marines, and airmen who serve to keep us free; it is a requirement as far as I am concerned. When asked what was the hardest thing about the war the heroes had very similar answers. For Bill Presley the hardest thing seemed to be that of the five southwest Sheffield boys who went to war together, only one returned. The one who returned was him. While Bill seems to be a very easy going, laid back guy, he also appears to be a very thoughtful and kind person. He seems to have adjusted well to life outside of war, but still has scars that are not seen with the naked eye. The burden of living up to being the only one to survive must be very heavy. He has not forgotten the soldiers that did not return, or their families, even after almost fifty years. It brings to my mind the song by Kris Kristofferson that echoes the sentiments: Why me, Lord? What have I ever done to deserve even one of the blessings I’ve known? Why me, Lord? What have I ever done to enjoy even one of the blessings you’ve bestowed? I recounted the story of a Vietnam vet that I know who said that the hardest thing about the war was having to shoot down a child who was seven or eight years old. But, that child was carrying a live grenade and heading toward that soldier. There was no choice. It was kill or be killed. The military conditions soldiers to kill reflexively . They train soldiers to target locations, not target humans. The term locations suggests target the location of the imminent threat, whether it be bullet, bomb, or grenade. Soldiers who kill reflexively in combat will likely one day reconsider their actions reflectively. If soldiers are unable to justify to themselves the fact that they killed another human being, especially a civilian, they will likely–and understandably–suffer enormous guilt. This guilt manifests itself as post-traumatic stress disorder (PTSD), and it has damaged the lives of thousands of men who performed their duty in combat. The use of child soldiers was rampant in the Republic of Vietnam: South Vietnam’s steaming jungle of hell from 1964 to 1972. In the most notorious case in Vietnam/Cambodia/Laos, the Khmer Rouge communist group exploited thousands of desensitized conscripted children to commit mass murders and other inhuman acts during the Cambodian genocide. The brainwashed child soldiers were taught to follow any order without hesitation. And yet there were those celebs of the day taunting our soldiers and calling them “Baby Killers”. Oh, please, just shut up you who disrespected our boys upon their return home!!! When I was telling of this soldier, Sam Barron, one that Harold and Bill likely knew, I could see motion in Harold’s body. I witnessed a stiffening in his body. I saw his head shake with affirmation. His hands were shaking grand mal seizure-like and I believe that is when Vicky reached over and grasped his hand to quell the shaking; she held his hand with a squeezing grip like I have never seen in a woman. I witnessed a river of tears well up in his big blue eyes. The tears welled up in his eyes in such volume as I have never witnessed, and yet they did not flow down his face. Those big blue eyes and that river of tears that refused to flow is stamped indelibly into my mind. I told Bill and Harold that the soldier in question, mucho macho that he was, was torn apart by having to kill a kid in order to live. Harold nods his head, yes. He holds up two fingers and in the softest masculine voice you can imagine said, “Two.” He said without words that was the hardest part of the war for him. Wow. Now that was emotional. At that point I asked Harold if he had family. At first he seemed confused. I asked since Vietnam did you have a family and kids? He said he had five kids. Well, if he had not done what was necessary in Vietnam, I stated, those five beautiful human beings would never have existed. At that point I felt some of the tension in his body fall away. Harold Lee Hovater was awarded a wall full of awards, medals, ribbons and stars. And he deserves every single one of them. And then the discussion went into more global topics about the Vietnam War. There were the topics of: was it a conflict or a war since it was never declared a war, women in combat during wartime, the lack of respect that these returning heroes encountered, and the use of Agent Orange. Volumes could be written about each of these topics and there would be as many opinions of each topic as there are people discussing the topics, though some may be uninformed and lacking in knowledge of the history on the topics. Those can be ignored. But for what matters, it is the opinion of those who served, sacrificed, and suffered that stand above the rest of the crowd. Jane Fonda’s and other celeb opinions do not count one iota. Protestors of the war opinions do not count one iota. Mainstream media opinions do not count one iota. Politicians and government officials’ opinions do not matter not one iota. Nor do the opinions of those who refused to serve count one iota. And as never before, the history books often do not reflect the true story of political events. Each of these men had his own personal opinion on each of the above subjects, but it is the Agent Orange issue and the lack of respect these returning soldiers have been shown that should concern us most. Agent Orange was the code name for a herbicide developed for the military, primarily for use in tropical climates. Although the genesis of the product goes back to the 1940’s, serious testing for military applications did not begin until the early 1960’s. The Vietnam conflict started in August of 1964 and ended in April 1975. That was a total of 116 months of combat. That was sixteen months longer than the American Revolution had spanned. American involvement in Vietnam began in the late 1950s; my father-in-law was one of the first Ambassadors to Vietnam in the early 1950s. Major combat forces began taking part in large unit combat in 1964. The purpose of the product was to deny an enemy cover and concealment in dense terrain by defoliating trees and shrubbery where the enemy could hide. The product “Agent Orange” (a code name for the orange band that was used to mark the drums it was stored) in, was principally effective against broad-leaf foliage, such as the dense jungle-like terrain found in Southeast Asia. The product was tested in Vietnam in the early 1960’s, and brought into ever widening use during the height of the war (1967-68), though it’s use was diminished and eventually discontinued in 1971. It was a combination of two chemicals mixed with kerosene or diesel fuel and then distributed from airplanes. It was also sprayed by hand and from vehicles. The TCDD’s in Agent Orange are man-made and unwanted by-product of the manufacturing process of Agent Orange. It is NOT found in nature. It is toxic to humans. The Agent Orange used in Vietnam was later found to be extremely contaminated with TCDD, or dioxin. Estimations are that some 19 million gallons of Agent Orange were sprayed on South Vietnam during the years the war was raging. Mysterious and seemingly not diagnosable ailments started occurring among those who had served their country in the Republic of Vietnam: South Vietnam. It would seem that the government and the VA made the veterans feel crazy, for even though there were medical problems apparent and obvious, there were no diagnoses to be had. Scores of them had symptoms, but no disease. Huh? This added to the psychological stress of those veterans and their families. The government had failed our servicemen again; so, what else is new? Many who returned from warfare in the Republic of Vietnam: South Vietnam point to the prolific use of Agent Orange in resulting illnesses suffered. Cancer, birth defects, mood swings, depression and skin problems were reportedly contracted after the exposure to the by-products of Agent Orange. In addition, the veterans of this war had to live with the fear that they would contract one or more diseases as a result of exposure to the toxins in Agent Orange. The negatives poured upon these servicemen must have felt insurmountable to those who returned home. At a recent appointment to the VA in Birmingham a sailor who became disabled after his service in the Persian Gulf War, encountered a Vietnam veteran who was still trying to get on the Agent Orange Registry and they told him it would be several months before they could schedule him for an appointment. The government and the VA already knows who served over there, so there is no need for veterans to have to prove their exposure to the toxins. Only recently have some of the rules and criteria to exposure been corrected. He gives another example of a Navy man who had benefits denied because the VA said he did not serve in the areas that were affected. Well, no, but they failed to conceive that he was stationed there; but, he as a mailman for the ship went into those affected areas on a daily basis. The use of Agent Orange in Vietnam brought the discussion around to the fact that for the first time known in history, the government had used an agent of destruction to plant and animal on our own men and women in battle. And yet they continue to sign up to serve even yet. When asked if they would serve their country again, both men answered with, “Yes.” Harold Hovater had served more than one tour in Vietnam voluntarily. Bill Presley had answered his country’s call for his first tour of duty; but re-upped for a second tour. Only one four letter word describes these two men accurately, and that is the four letter word HERO! Pictured from the left: Leonard Bauck, Ray Ashnault, Harold Hovater, behind Harold is unnamed, and at the far right is unnamed. each answered the call of his nation and served with distinction in a conflict that lasted longer than the American Revolution-The Vietnam War. And now we will WTF! And now we WTF: Wave The Flag for them. From now through Memorial Day, may each of us post as our profile photo a U.S.A Flag to honor them and veterans who are serving and have served in our military. This post is a prelude to the article Remembering the Shoals will publish shortly about two outstanding and valorous Vietnam veterans of the Shoals area, it is appropriate that others that we can identify be honored as well. The Shoals area has given its sons and daughters to the service of our country since time immemorial, some never came home. It would be wonderful if friends and family would add to the information about the soldiers who served through comments and photos added to this article and on our Facebook page. These are likely not all who were never to return from Vietnam; please add that information as well. 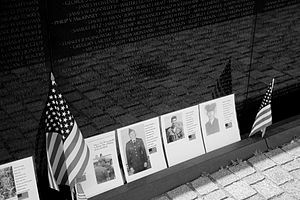 The photos are of Bill Presley and Harold Hovater who served with those who were KIA in Vietnam; the gravemarker photo is of Dennis Laverne English KIA; and actual photos of the war are courtesy of Bill Presley and Harold Hovater.